To order a copy now at a discounted price for postal delivery. A review of this book by Barry Sturman appeared in Issue 10 of the Journal of Pyrotechnics, Winter, 1999. Abstract: A flame of fireworks generally contains many solid or liquid particles which cause a continuous spectrum. In order to apply the line-reversal method of temperature measurement to such flames, the author introduced a theoretical equation which denotes the ratio of the intensity of the resonance line part to that of the neighboring part of time spectrum when the standard light beam is introduced into the spectroscope through the flame. This equation shows very clearly that as long as the flame does not contain so many particles that it prevents the standard light beam from permeating, the line-reversal method is always effective. Using this equation a method of measurement of a flame temperature which is higher than the available maximum brightness temperature of the standard light is proposed. The author has applied this method to two examples of high temperature fireworks flames, which consist of some magnesium powder composition, and we obtained the temperatures of 3,159 and 3,214 K.
Reprint Information: Number of pages = 14. Price for this reprint is $7.00. Abstract: Using the theory developed in Part I, flame temperatures for various fireworks compositions have been measured by means of line-reversal of Na-D lines. (1) For the case of low flame temperature compositions — The compositions that contain combustible organic materials (i.e., shellac, rosin, pine root pitch, etc.) are commonly used in ordinary fireworks.The author has prepared various combinations of components to see the influences of oxidizers, fuels, coloring agents, etc. Temperatures are measured by method 1 from Part I. The result shows that the highest temperature appears at the base of the flame. Generally potassium perchlorate gives higher temperatures than ammonium perchlorate.Potassium nitrate always gives lower temperatures than other oxidizers. (2) For the case of high flame temperature compositions — A composition that contains magnesium powder can create a flame of very high temperature of more than 2,900 K. Temperatures were measured by method 2 from Part I. In this case the photographic method was applied to measure the intensity of spectrum lines, and we have obtained temperatures of 2,700–3,000 K, but the accuracy of these data are not as good because of the uncertainties of the photographic method due to the instability of the flame. Reprint Information: Number of pages = 23. Price is the maximum charge of $10.00. Abstract: Blank runs were made with compositions not nominally color-producers to investigate the lines, bands or continuous spectra which appear as background and disturb the desired spectra of red, yellow, green, etc. These sample compositions consist of solid materials such as oxidizers (ammonium perchlorate, potassium chlorate, potassium perchlorate, potassium nitrate, etc. ), low temperature combustibles (shellac, rosin, pine root pitch, etc. ), and magnesium powder for high temperature combustibles. In the case of low temperature class sodium D (Na-D) lines (5890 and 5896 Å, caused by impurity contained mainly in the oxidizers), continuous spectra (caused by carbon particles and potassium atoms) and K lines (5802, 5783, 5832, 5813; 5340, 5324, 5360, 5343; 5090, 5084, 5113, 5080; 4044, 4058 Å) are observed. In the case of high temperature class Na-D lines are also observed, and in addition to the above, MgO bands and continuous spectra (the latter are caused by solid metal oxide particles and K atoms) are found. The main spectra of disturbance are Na-D lines and continuous spectra. Purification of ingredients is very important to remove Na-D lines and to obtain fine colored flames. In the case of high temperature class, the addition of ingredients of chlorine compound such as polyvinyl chloride, ammonium chloride, etc. to a composition is effective to decrease intensity of the continuous spectra, and it is supposed that the metal oxide of the solid phase is converted into the metal chloride of the vapor phase in the presence of chlorine or hydrochloric acid in the flame, but this should be ascertained by further experiments of higher accuracy. The addition of shellac is also effective to weaken the intensity of the continuous spectra, decreasing the temperature of the flame. The permeability coefficients and black body temperature of flames of basic compositions are measured for reference. Reprint Information: Number of pages = 17. Price for this reprint is $8.50. Abstract: Spectra of flames of red, yellow and green color compositions are examined under various conditions. a. Red Flame — A red flame is given by bands of some strontium salts. These bands consist of five main bands [i.e., a (6013), b (6203), g (6300), d (6428) and e (6558)], where each figure shows wavelength of the maximum intensity in Angstroms (Å). The influence of chlorine on a band is quite different from others, namely a band is rather weakened by chlorine but others are intensified, and this effect of hydrochloric acid gas is higher than that of chlorine gas. Especially in low temperature class this is very clearly observed. The influence of kinds of strontium salts is very small, and that of oxidizers which produce either chlorine or hydrochloric acid gas is very remarkable. If we add some ingredients which have chlorine, they can intensify each bands only in case of high temperature class. The effects of calcium (Ca) Salts were also examined. b. Yellow Flame Composition — A yellow flame is given by sodium salts. The spectrum consists of mainly Na-D lines, but in addition a continuous spectrum of Na atoms appears between 5,800 and 6,100Å and changes the flame color to rather white, especially in high temperature class. c. Green Flame — Only BaCl bands can give green flames when barium salts are used as color giving ingredients, and no chlorine composition cannot give green color because in this case, only BaO bands appear, giving white color to the flames. In presence of chlorine both BaCl and BaO bands appear and the effect of chlorine or hydrochloric acid gas in a flame are seemed to weaken the BaO bands and on the contrary to intensify BaCl bands, and the effect of chlorine gas is rather lower than that of hydrochloric acid gas. And so, ammonium perchlorate gives more clear green color than potassium perchlorate . Adding some kind of chlorine compound is also effective to intensify the green color. Reprint Information: Number of pages = 30. Price is the maximum charge of $10.00. Abstract: We can see three kinds of flame color (i. e., blue, light green and reddish orange) when we insert a small copper piece into a flame of a burner. The blue color is caused by CuCl bands, and the strongest lines between 4269–4560Å. Our purpose is to use this color to fireworks. This is given by some copper salts or copper metal powder in the presence of chlorine or hydrochloric acid gas, but if concentration of gas is small ,the blue color is disturbed by light green color, which seems to be caused by a continuous spectrum of other copper chloride bands (5263–5531Å). The flame spectra are examined under various conditions. In, the case of low temperature class, ammonium perchlorate is the best oxidizer and gives excellent bright blue. In the case of high temperature class it is necessary to decrease the percentage of magnesium powder, because the CuCl bands seem to dissociate with increasing of magnesium. Abstract: The previous papers showed the effect of magnesium powder as a combustible in high temperature class compositions. In this paper the effect of aluminum powder is examined. In general aluminum melts and is sprayed as sparks out of the flame, and is not so evaporable because of its high boiling point. And in this case the intensity of the spectrum of color-giving bands is not so high as in the case of magnesium. Reprint Information: Number of pages = 3. Price is the minimum charge of $5.00. 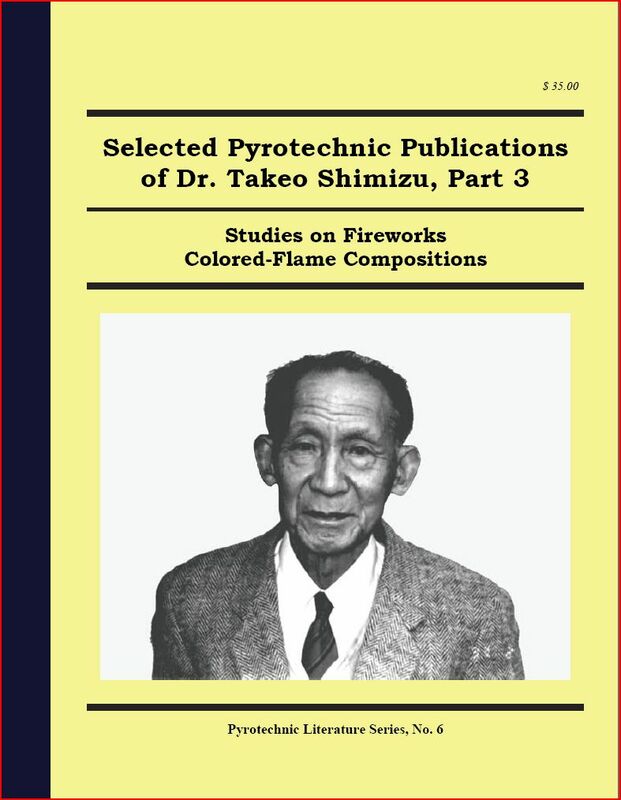 Abstract: (1) The spectroscopic studies in previous papers are summarized so as to apply the principle of flame color creation to practical use. (2) According to the results of (1), various samples of red, yellow, green and blue of several composition series are prepared. Their flame colors are examined by the naked eye and good colors are selected. According to these, effective color zones are written as circular lines in trigonometrical graphs. (3) As far as these studies are concerned the important results which seem to be common for each series are as follows — (a) The width of an effective composition zone in a graph is very narrow In the case of low temperature class and is fairly wide in- the case of high temperature one. (b) Ammonium perchlorate is the best oxidizer, for it can produce HCl in a flame and creates deep color. (c) Polyvinyl chloride is also the best additional ingredient which can create a deep-color by producing HCl gas in flame like ammonium perchlorate. (d) It is necessary to protect compositions from moisture perfectly in A case of high temperature class lest magnesium and other ingredients should react each other. For-practical applications deep and brilliant color flames are obtained only with this consideration. Reprint Information: Number of pages = 12. Price for this reprint is $6.00.